Can Alarmists learn the truth about the falsified AGW hoax? A respondent (let's call him "Jay") on a Climate Change Discussion forum has questioned some of this blog's positions. Next, for some strange reason, he mentions the multi-flawed 97% myth. I find the ethics of the argument against the 97% based on an economic argument. And you can claim the percentage hogwash but its a fact that there have been on 3 papers that countered the findings that have been peer reviewed. When compared with pre-1800s levels do you think that mean global temperatures have generally risen, fallen or remain relatively constant? In fact, the final figures came down to 79, and 77 agreed with the proposition. Why 2 did not agree is anyone guess, but 77 out of 79= 97%. The other two papers are equally flawed. Cook et al's 97.1% morphed into 0.3% when his data was checked. Not a good number, wouldn't you agree, Jay? And it was done scientifically. And then Jay drags out the funded by BigOil idiocy. Hey, BigOil, the bank account details are at the top of the page! Send it down, baby. Where as I find the once (sic) who claim science skepticism getting funding from oil and energy interests. 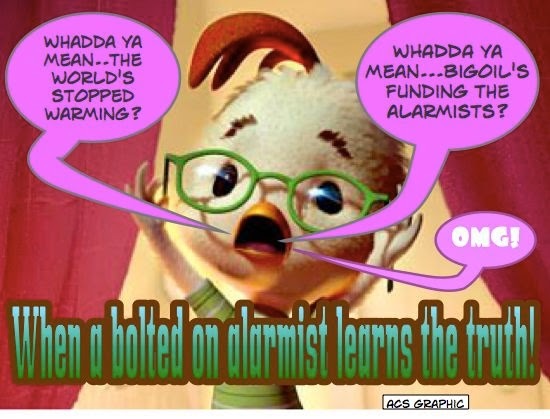 Do you know, Jay, that BigOil funds the Alarmists? See Jo Nova's facts here. See also: Skeptics are funded by Big Oil? NO, the Alarmists are. Yet, the alarmists keep pushing the lie. Jay, look at the science, not at economics or some other sidetrack. The real science of observational data. The data that show no significant rise in temperature this century while the falsely accused (vital-to-life) atmospheric carbon dioxide thankfully keeps rising.